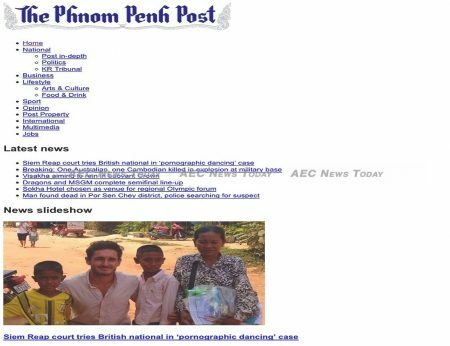 Failing a massive cash injection in the next 60 days the future of Cambodia’s oldest English-language daily newspaper, The Phnom Penh Post, appears grim, with the 26-year-old tabloid set to become the latest victim of Cambodia’s rush to compliance and ramped up enforcement. 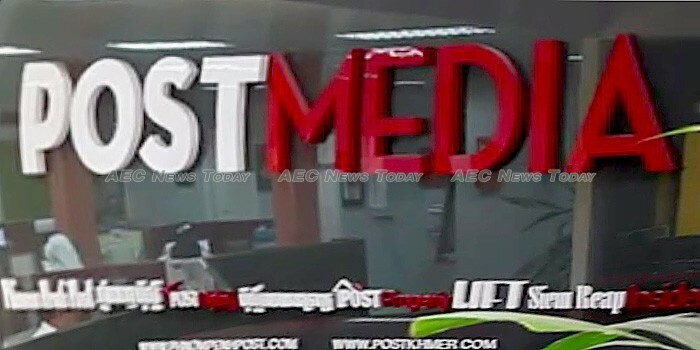 According to a person claiming to represent a group of self-proclaimed computer ‘hackers’ and ‘truth in media’ evangelists, Post Media Co., Ltd., has been slapped with a $3.9 million tax penalty over its failure to enter a US$2.5 million money transfer from Australia last year into its accounts. Additionally, the group claims that Post Media, publisher of the English and Khmer language editions of the The Phnom Penh Post, is scheduled to soon pay a more than $200,000 bank loan, adding that a Phnom Penh court last week ordered the company to immediately pay a former CEO a six figure settlement. 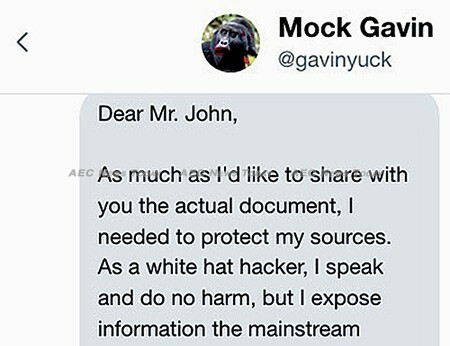 Using a freshly minted account on the micro-blogging platform Twitter, @gavinyuck described his “group” as a loose coalition of white, grey, and black hat hackers with a disdain for opaqueness in the Cambodia media and supportive of the government and the current direction of the country. The freshly minted @gavinyuck account claims Post Media offered $50,000 to settle an alleged $3.9 mln tax bill – open to see the full transcript. The Twitter account began calling out The Phnom Penh Post, individual staff members, and media organisations on Monday, March 12. Messages sent by the user of the account alleged a lack of transparency by the publication in vigorously reporting on The Cambodia Daily‘s battle with Cambodia’s General Department of Taxation (GDT) last year, but failing to disclose its own tax problems. Last September the almost 25-year-old The Cambodia Daily ceased publishing after receiving a recalculated tax assessment for the prior ten years totalling some $6.3 million in unpaid taxes, penalties, and interest. At the time The Phnom Penh Post was at the forefront in reporting on The Cambodia Daily‘s “exorbitant” tax bill, labelling it as a thinly disguised attack on media freedom. At a Town Hall meeting organised by the Overseas Press Club of Cambodia (OPCC) last September to discuss how the media should respond to the ‘attack on media freedom’, one senior staffer from The Phnom Penh Post dismissed questions about how the lack of compliance hurdle could be overcome before the media freedom topic could be approached, replying that the assessment was not a fair and proper audit. At the time it was widely known around town that GDT officials were at the same time examining records at The Phnom Penh Post, with one staffer describing “mountains of documents piled up in the fishbowl”. No mention of this was made in any of the publication’s reports on The Cambodia Daily. When asked about this, along with unconfirmed reports fuelled by comments from staff since the beginning of the year that the The Phnom Penh Post had received a $2 million tax penalty in 2016 for allegedly not paying income tax on staff salaries, the same staffer brushed aside the question and refused to discuss it further. If true, it would be a serious omission of a significant fact in The Phnom Penh Post‘s reporting at the time. According to the person operating the @gavinyuck Twitter account, Post Media allegedly attempted to settle the $3.9 million assessment with an offer of $50,000, which was allegedly rejected last week by the GDT in a reply sent to Post Media chairman and majority shareholder William (Bill) Clough. ‘With regard to your justification and the reasoning that the amount of over $2.5 M transferred from Australia were (sic) in the form of a capital injection to support the running cost of Post Media Co., Ltd., when as a matter of fact these injections were neither declared in its monthly and annual tax filing with GDT nor were they disclosed to GDT in its financial statements. ‘On the contrary, our tax audit team discovered these transactions through Post Media Co., Ltd.’s bank statements and as such they were treated as subsidies or revenues which are taxable under Section 4.8 of Prakas No. 1059 dated 12 December 2003 on Tax on Profit. By law, failing to appropriately declare or disclose such transactions to GDT is considered as an act of TAX EVASION. The ‘hacker’ also alleges that last week a Cambodian court ordered Post Media to immediately make a $135,000 payment to former CEO Chris Dawe in relation to a civil suit brought by the latter, and that the company is due to soon repay a loan from Vattanac Bank totalling in excess of $200,000. Mr Dawe, a veteran media entrepreneur, was appointed CEO of Post Media in 2012 and was unceremoniously dumped in 2015 by Mr Clough, who announced in a memo to staff dated November 23 that he would be taking over as CEO upon his return to Cambodia from Australia. In the interim chief financial officer Alex Odom, who originally joined the company to trim costs, was appointed acting CEO, with the appointment subsequently becoming permanent in March 2016. In October 2017 current CEO Marcus Holmes was appointed to the post. 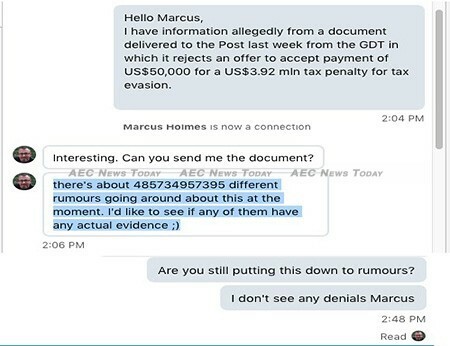 Post Media CEO Marcus Holmes failed to deny that the company has been issued a $3.9 mln tax bill – open to see the full transcript. When contacted via LinkedIn Mr Holmes failed to reply to several invitations to deny the accusations, after claiming in his initial response “there’s about 485734957395 different rumours going around about this at the moment. I’d like to see if any of them have any actual evidence ;)”. Mr Holmes stopped responding when shown the information alleged by the self-described ‘hacker’. As The Cambodia Daily‘s 30 day deadline to pay its adjusted tax assessment ticked down, media reports at the time claimed its tax assessment was unfair, not based on a “proper audit”, and that it could not appeal. Not entirely true. Though a Cambodia tax payer needs to be more than 100 per cent certain that they are correct before appealing, as the cost is high if they are not. Under Cambodia tax law a tax payer who disagrees with a tax assessment can file an appeal with the Committee of Tax Arbitration (CTA) within 30 days of the ruling, after first depositing the full amount of the sum claimed in the assessment as security. The CTA will rule on the matter “within 60 working days, or a reasonable time frame”. Established in 1992 by respected veteran journalist Michael Hayes and Kathleen O’Keefe, The Phnom Penh Post is Cambodia’s oldest daily newspaper in any language and employees more than 200 people. Rumours about the future of The Phnom Penh Post have been circulating in the capital for sometime. Foreign staff employed there began saying several weeks ago that they had been told a decision on the publication’s future will be made in March. More recently staff and others associated with the publication have been overheard around Phnom Penh talking about a more tax assessment having been served on the organisation than the 2016 one, with figures of between $2 – $4 million being bandied about. The two most likely scenarios being mooted for the publication’s future, according to staff, is that it will shut down after the Cambodia general elections in July due to Mr Clough no longer willing to keep propping up the loss-making venture, or it will become an online publication only. However, The Phnom Penh Post has been slow to adapt to digital innovation. Its website operates with incorrectly configured SSL/TLS security, is frequently broken, and it has no mobile app. Additionally, it breaks Google’s rules about popup advertising making it only a matter of time until it is blocked in the latest version of the Chrome web browser. During the very public spat between The Cambodia Daily and the GDT last August it was revealed that if a tax assessment is not paid within 30 days, the GDT will issue a warning that it intends to cancel the organisations business licence and freeze bank accounts if the debt remains unpaid after an additional 30 days. If the accusations by the @gavinyuck Twitter user are correct, without a massive cash injection The Phnom Penh Post could have less than 60 days before the GDT suspend its publishing licence and freezes its bank accounts, and not much longer despite any tax issues. The closure of The Phnom Penh Post would be a tragedy for Cambodia as it heads into a very one-sided general election in July, removing the last bastion of independent daily news journalism from Cambodia at exactly the time the country needs a strong, resilient, unbiased, and transparent media the most.